Anne-Sophie Mutter, who in 2006 celebrates the 30th anniversary of her public debut, will also mark the 250th anniversary of Mozart's birth with a series of new recordings of all his major works for violin. She will record the trios live in Baden-Baden with Sir André Previn and Daniel Müller-Schott, while the concertos and Sinfonia concertante have been recorded in London with the London Philharmonic Orchestra. Her fellow soloist in the Sinfonia concertante is the viola player Yuri Bashmet. She will also be recording the violin sonatas with Lambert Orkis. The first recordings to be released feature the concertos and will appear in the autumn of 2005. 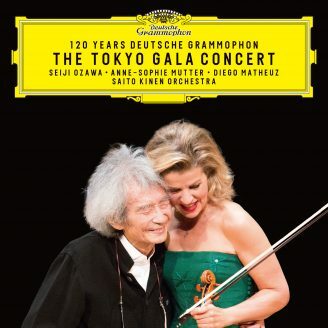 Anne-Sophie Mutter conducts these works from the violin. Here she talks to Michael Church about Mozart and modernity and about the genesis and nature of her project. What's your earliest Mozart memory? ANNE-SOPHIE MUTTER: Hearing a recording of Clara Haskil when I was six. For me her style of playing Mozart has always been superior to anybody else's. The lightness of touch, the delicacy of phrasing, the unforced flow, with nothing over-romanticized. The beauty of her sound seemed to me what Mozart himself always looked for, and what he always mentioned in his letters to his father when he found a player who was able to convey strong emotion with a beautiful sound. Were there also violinists whose Mozart playing impressed you? ASM: There were some wonderful early recordings by Isaac Stern, and also Arthur Grumiaux – but after that I don't think I ever heard string players performing Mozart as I thought he should be played. ASM: The approach these days is over-virtuosic, and lacks elegance and purity and modesty – Tchaikovsky's description of Mozart's music as "angelic" is exact. Mozart's music is like an X-ray of your soul – it shows what is there, and what isn't! Yet Mozart isn't taken very seriously by the younger generation. His music is looked down on as something relatively simple – people want more bravura. The important thing is not the number of notes, but the interaction of the instruments, and the development of the ideas. That's why it's important for an artist to play a complete cycle, whether of the Beethoven sonatas or the Mozart ones, to see where they came from, and where they lead, which is to a completely equal partnership between piano and violin. ASM: My Mozart project doesn't actually start here. It began very modestly when I gave my debut at nine, playing the Second Violin Concerto with a provincial orchestra. I made a more spectacular debut with Herbert von Karajan in Salzburg when I was 13, playing the wonderful G major. And since then Mozart has always been present on a daily basis in my life: I've never stopped thinking about him, even when I was playing contemporary repertoire, and I've always been trying out new ways to get closer to him. He's the composer I have grown up with, who was always there waiting for me at every juncture of my career. Some of these works you have already recorded. How do you feel about revisiting them? ASM: After 20 or 30 years, you start to think you know a piece, even a piece by Mozart. But I've always fought against this feeling: I've always enjoyed finding something new in the score, even if it's only a line in the second fiddle whose importance I had noticed before. And anyway, a lot has happened in my life over the last 30 years – that alone seems reason enough to try it a second time. I think of T. S. Eliot's words about discovering a place for the first time, even though you have been there before. And I think of the Austrian painter Arnulf Rainer, who says that underneath each of his paintings is another painting, and that even if the viewers don't fully see the painting underneath the top layer, he knows it's there. That's true for a musical interpreter as well. What comes out when you are twelve years old does so purely by instinct, and if you continue to be guided by instinct it's not enough – you just repeat yourself. You can only grow artistically if instinct is combined with a curious mind. ASM: I had the idea for it when the possibility of playing the concertos without a conductor came up, six years ago. I suddenly felt an urgent desire to "do it right this time". But the last thing I want to do is pretend that my view of Mozart is definitive. Partly because he doesn't need my help – he'll live long after I am totally forgotten. I do it simply because I love his music very much, and because it has made my spine tingle, and moved me to tears, and because it always reaches out to audiences. This project is a celebration of him and a deep bow to his genius. I hope there will be some positive surprises for the listener, but these recordings are not intended to displace those that already exist. How does it feel to – in effect – conduct? ASM: I'm not pretending to be a conductor. I've never studied conducting technique as such, and I don't have any conducting skills. But I am a leader – partly because it's my character, and partly because I know precisely what I want from the score, and know how to explain it to an orchestra, and convince them of my viewpoint. Mozart himself was not a conductor, and in a humbler way I am trying to emulate him, using an enlarged chamber group, unifying and inspiring it with a single idea. Because inspiration is the key – making people want to follow your idea, and be part of that recreative process which is so exciting when it results in dialogue that feels totally spontaneous. Rehearsing is important, but it is pointless to announce a pianissimo in bar 29 in the morning, when you know that in the evening you'll be reliving the piece anew. Without a conductor, players must react fast, and it's bound to be more spontaneous. How did you begin this new venture? ASM: My first foray was with the Salzburg Camerata. And then I thought, why not do it with the Wiener Philharmoniker – and with them I learned a lot about the scores, because the players came forward with some wonderful ideas. We had many discussions, and my ideas initially met some resistance, but I think I was able to convince them. The London Philharmonic, with whom I recorded the concertos, are very modern players. Some orchestras sound velvety, but the LPO players are more like a Porsche – vibrant and youthful (though I hate using that word), and they can pull off anything. They are always sitting on the edge of their chairs – and their Mozart is fast, not in terms of tempi, but in reaction time. It's chamber music without ever leaning back in the chair: some chamber-music playing is just too comfortable and mezzoforte-ish, you know – playing for yourself, then you drink a nice cup of tea, and you might as easily be at home: you're not concerned with the audience out there. The nerves are not sharp. With the LPO I don't play as a soloist but as a member of the ensemble. What is Mozart's technical challenge to you as a violinist? ASM: It's much more than a matter of playing him beautifully. It's very much about phrasing, because often in Mozart you have 16th-notes (semiquavers), of which two are legato and two are "jumped" – spiccato. Then there is the whole issue in staccato playing of distinguishing between dots and strokes (vertical dashes). The length of every note in the score is of utmost importance. Today I see pupils in my foundation struggle with that kind of bowing, but it is a crucial tool for playing Mozart: it means you have to attend to the space between the notes. If a run of 16ths is not totally equal, either it will sound like an etude, or it will be very inelegant. The spacing between the notes is part of the art of playing Mozart. Another element in that art is refinement of sound quality, particularly in those dance-like movements, the rondeaux, which inspired him when he was in Paris. That too doesn't come easily. With Mozart every note is precious, and has to be thought about – particularly as the orchestration, which is both everything and nothing, leaves you so painfully exposed. There's not the incredible number of notes you find in the Romantic repertoire, which creates a seductive backdrop for you. But with Mozart every instrument has to be there at the right moment, and in the right taste and shape and tempo – and that demands high mastery from everybody. Maybe this daunting knowledge is what has prevented me from re-recording him sooner. It's not just something you knock off in an afternoon. Where do you stand in the authenticity debate? ASM: So-called "authentic" performance is, I think, an impossibility for us. We hear differently from the way Mozart's contemporaries did. And we can't pretend to be able to go back to hearing as they did 250 years ago. We are used to different concepts of beauty and style: we expect things to be richer in texture. I don't use gut strings: I'm a strong defender of the modern stringing of the violin, because it expands its range, not only of volume, but also of colour and shading. And those expressive resources make up an integral part of Mozart's compositional style. There was a good reason for the further development of the violin bow in 1755, a search for greater expressivity and flexibility. So if he were alive today, he wouldn't be a period-performance specialist? ASM: I think he would occasionally employ the period-players' non-vibrato, and the leanness of their sound – he wouldn't like a sound that is thick and inflexible. But he'd like a bigger orchestra – the size of his orchestras depended on what was available. My orchestra will be 8-8-6-4-1, which is relatively large for the period, and hopefully beautiful! But the sound will still be lean, when necessary. For example, we recorded certain Rondeau-Minuet movements, as well as the Adagio of K. 219, with only quartet strength in the strings. We also have to remember that a very small ensemble in a very large hall tends to fade, to get spineless, and one reason we need larger orchestras is to cope with our much larger halls. Not many string players have the ability to create a pianissimo that really carries – their pianissimos tend to drop down into the first row. A pianissimo has to travel, and it needs to glow from within, not sound like a grey mouse. How important is the choice of tempi? ASM: Absolutely crucial. But though there are wrong tempi, there's never only one right one. Tempo for me resides in the relationship between the movements, and for me that is something immovable. If I start an allegro I have to know how the andante and presto are going to relate to it. But how fast the allegro will be depends on the size of the hall, on the acoustic and, if it's a sonata, on the mechanics of the piano, and on its repetitive ability. In some of the late Mozart sonatas the fast movements demand rapidly repeated notes, and contemporary instruments had a greater facility for that than our modern ones, and also far less resonance. That indicates two aspects of Mozart's music which we simply cannot replicate. Then you would also play a second movement in a more flowing tempo, because the sound was thinning and dying out. With a modern piano you don't have to do that, and in a large hall you have to let the instrument breathe and sing the notes out, otherwise they will overlap. This is also true of the last movements, which unfortunately we cannot play as fast as you could have done on an instrument of Mozart's time. The repetition is slower, and the sound lasts longer – all this makes everything slightly slower. But of course Lambert Orkis will try to play most of the sonatas without pedal, so as to make the sound as dry and transparent as possible. We will get as close as we can to producing what would have been heard in Mozart's time. All these considerations prevent the tempi from being set in stone. What's your view of the concertos, which are all early works? ASM: Mozart himself performed all of them with tremendous success, particularly the first which is still in the Italian virtuoso style, where the orchestra is modestly humming in the background while the violin does the somersaults. The second is much more elegant, reflecting the French influence, including the Rondeau finale, but these first two are more conventional in every sense compared with the last three. The musicologist Alfred Einstein was right to describe the Adagio of K. 216 as seeming to have fallen straight from heaven – the effect of muted strings was quite new and gives the entire movement a magical atmosphere, and the Rondeau is much more daring than previous ones. What's more, there's now an equal dialogue between violin and orchestra, as opposed to the first two concertos where it's merely the partner in the background. Here Mozart has achieved the ideal shape of the violin concerto. Many violinists are daunted by the opening of the K. 218 Concerto. Are you? ASM: It's considered to be very difficult, but I have never found it so. It's way up on the E string, a little fanfare, and some of my colleagues hate to be up there. As with the coloratura aria in Zauberflöte – either you get the high notes or you don't – and everybody can tell if you don't. But that work is remarkable too: the tutti has something of a symphonic drama, much more elaborate than before, more developed. The Andante is introduced by the wonderful singing of the oboes, and the final Rondeau surprises us with its metre and mood changes. But the crowning achievement is K. 219, because there Mozart experiments with many new ideas. That is the most daring and multi-layered concerto. It has the most unusual first solo entrance, not with the allegro main theme, but with an adagio introduction, unfolding a lovely new musical idea. Following the lyrical second movement, a full-scale Adagio, the finale ends in a charming minuet. It's interrupted, however, by a wildly demonic "alla turca" episode, whose exotic character is actually Hungarian rather than Turkish. But the Austrians of Mozart's time liked to apply that term to any musical idiom coming from the East. How do you view the Sinfonia concertante? ASM: Mozart wrote it on his return to Salzburg in 1779, having become familiar with the genre both in Paris and Mannheim, where it was à la mode. The title reflects the fact that it really is a symphony with two instrumentalists, who are treated as equal partners of the orchestra. The Concertante is clearly written with the very fine Salzburg instrumentalists in mind. It is a darkly coloured, dramatic work, with highly contrasting moods and a subtle and complex balance between solo and tutti sections. Also interesting is the use of divided violas. The C minor Andante is probably one of the most touching of all slow movements. The whole work overflows with an abundance of ideas and is a wonderful example of the new musical language Mozart was developing at the time. ASM: For me he is the greatest viola player. He's spent 30 years enlarging the viola repertoire, and will leave behind many works, which he has inspired, for future violists to play. I like his hyper-emotionality, which you might not expect to find in a Mozart player, but which means he sometimes adds things to the score which I would never think of. I like to play with people who, while having an approach which harmonizes with mine, have very different ideas, so that we grow together like yin and yang. By whom are your cadenzas? ASM: By various wonderful violinists, but some I have knitted together, with a bit of myself and a bit of Monsieur X. It's a pity Mozart didn't write his own cadenzas down, as he did for some of the piano concertos. What should a good cadenza do? ASM: It should bring back thematic material, but it should sound improvised. And as modern soloists like me are not improvisers, we unfortunately have to have them written out. A cadenza should not break away from the style of the work, it should be like a summing up, an epilogue, but with a little touch of "Whoops! – here’s an extra thought". How did you choose which trios to record with Sir André Previn and Daniel Müller-Schott? ASM: To be honest, I took the ones which gave the violin most to say! But they're tremendous pieces, taking their shape from Haydn, with the traditional doubling in the early ones, with the fiddle and cello parts echoed by the pianist’s right and left hand and developing their relationship to a level of equality. This is Mozart writing for pure enjoyment, in the best sense of the word. How closely do you relate works to Mozart's life situation? ASM: These days we are too keen to dig into composers' personal lives. The music is for us, and everything else is private, and should stay in the dark. But some sonatas can be linked to events in his life. K. 304 may reflect his mother's death, but we should also remember that at the same time he also wrote the extravert "Paris" Symphony, and the equally extravert D major Sonata from the same set. And I think it's important to remember what else he was writing at the same time as the violin works. His very daring Sonata K. 526 evolved while he was at work on Don Giovanni and the "Jupiter" Symphony. Finally, in presenting this project, I gather you've chosen a new photographer to work with. ASM: I've always been looking for a photographic language which translates my feeling for music into pictures. I have worked with very good photographers in the past, but I needed a new visual language for this, a new expressivity, particularly because the music is so diverse. Tina Tahir seems to have the right poetry in her visual vocabulary to translate my ideas.